I’ve started using my sewing machine more and getting creative. Me and my pal lauren have started doing a craftanoon, so every other Monday we have an afternoon of making things togther. I thought I would share what I have been doing. 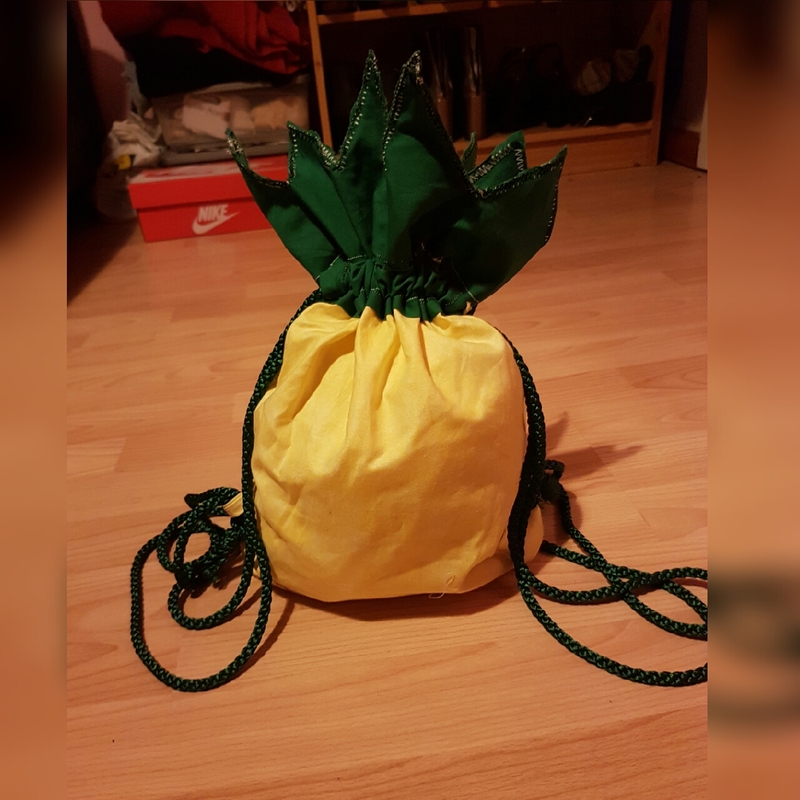 So I found a pattern on pinterest for a pineapple bag and there blog is makeit-loveit.com defiantly check them out! There’s lots of different ideas and inspiration. It took me about 3- 4hours to compeleted. The pattern is really easy to read and understand. Make sure you do follow step by step. My second project where cushions covers. I picked out a tropical print and pom pom trim for round the edges. I didn’t really follow a pattern I just measured the shape of the cushions. One round and one sqaure. I even put a zip on the back of them which I have never done before. The round cushion took about 2-3 hours And sqaure one took about 2hours. The first cushion I put the zip on last which made it 10x harder! So the second one I put the zip on first and it worked so much better, less fiddly. I got 1 metre of tropical material and 1 1/2 metres of pom pom trim. For both the round and sqaure cushion. So I started by cutting two sqaure pieces a little bit bigger than my cushion and cut one sqaure in half. 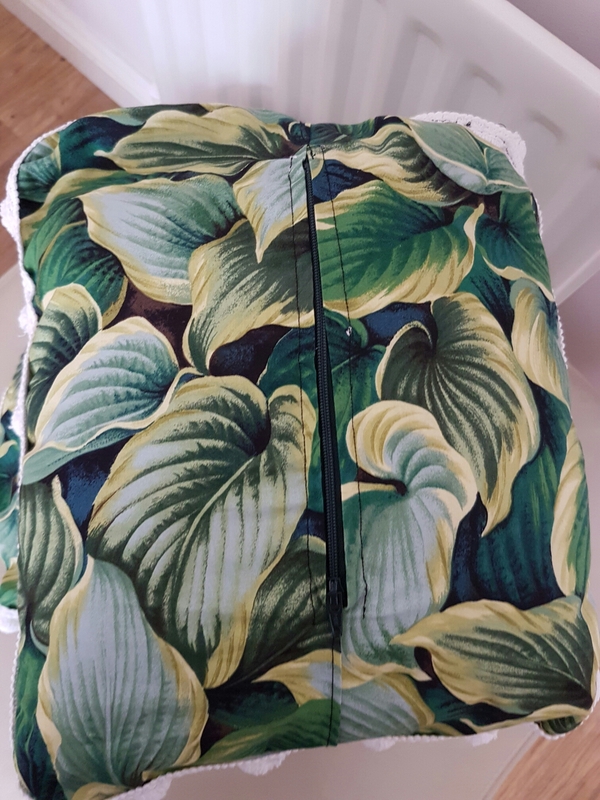 Then I pined the zip in the middle of the two half pieces folding over the raw edges to look abit neater, and sewed together from the inside rather than out the outside of the cushion. 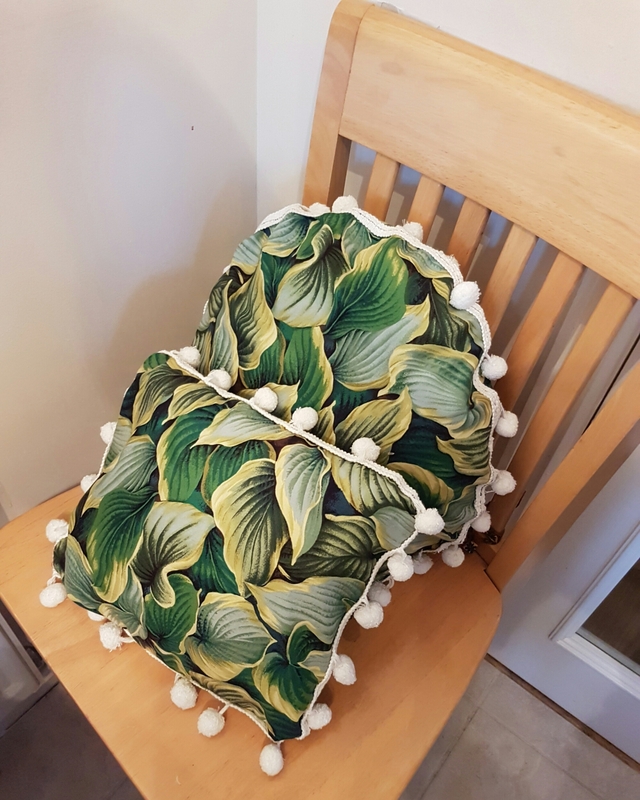 Then I pined the two outsides of the sqaures togther around the edges so when sown togther the cushion cover will be inside out. And sew togther. Then turn cushion cover the right way so tropical patten in on the outside now. Then pin your pom pom trim around the edge of the cushions covers. And sew. Now you are an owner of a handmade cushion! All material I used where from sew simple located at Taverham garden centre. All good prices and good selection of materials, staff are always so lovely and helpful.